The CDC reports that up to 1 in 5 children have a mental disorder. While autism is the fastest growing type, ADHD is the most common. According to studies, both autism and attention deficit hyperactivity disorder often involve similar environmental toxins, nutritional deficiencies and therapies. A child’s problems can range from stuttering to social awkwardness to suicidal thoughts – startling glimpses of the brain’s “check engine” light. Some brave parents quietly seek help, while others sport hopeful ignorance. Without an impending death threat, do we stand a chance of preventing neurodevelopmental disorders? As discussed in the previous post, pregnancy is a period of extreme vulnerability to environmental toxins that contribute to these conditions. An even more alarming thought is our lack of awareness of this fragile state. Professor Philippe Grandjean shares the nightmare that we may be losing our mental ability to plan ahead and protect our descendants from “brain drain” caused by environmental toxins. His new book “Only One Chance” outlines these current concerns with refreshing clarity and candor. Prevention through new awareness, research methods, and decision-making is paramount, but we still must explore how to treat existing cases of autism, ADHD, and even ordinary mental challenges. In truth, we are all on the “spectrum” of toxicity, exposed daily with diet, lifestyle, and surroundings. Considering the complex blend of environmental and genetic factors, each person will likely require a multi-pronged, individually-optimized approach for successful outcomes. Though we are not yet certain how to reduce the risk of autism or ADHD, it would do no harm to reduce exposure to suspected factors highlighted in research. We cannot expect physicians to offer expert advice on prevention or save us from our environment when they are only trained to treat existing conditions. Similarly, we cannot expect anyone to provide “Disease Prevention Counseling” before we start a family, buy a house, get a new job, or go on vacation. Prevention is currently in our own uneducated hands, particularly when there are very few industrial chemicals tested for neurodevelopmental safety. Perhaps our own conclusions can be drawn faster than warning labels on cigarette boxes that required many decades of research and aggressive campaigns. If a child’s risk of autism and ADHD begins during pregnancy or even conception, we must examine the current research of environmental factors and consider possible methods of protection that are safe and sensible. To cover the perceived “window of risk,” most of the proposed efforts outlined below should occur before, during, and after pregnancy as well as lactation. Of course, the products and suggestions listed below do not guarantee any level of prevention of any condition or symptoms, and treatments including supplements should be cleared with a qualified health practitioner. • Avoid smoking and drinking to reduce risk of ADHD: Smoking during pregnancy can dramatically increase the risk of ADHD and asthma (though not autism) in the child. In a recent study, children of mothers with alcohol-related disorders had a much higher rate of intellectual disability. Many symptoms of fetal alcohol spectrum disorder overlap those of autism, and more research is needed to identify possible reasons. These effects, like others, may be controlled by genetics and DNA methylation. • Avoid polluted air: Researchers found a positive association between risk of neurological disease and polluted, warmer air on the West Coast. Similarly, autism in children in the Los Angeles area was associated with traffic pollution exposure during pregnancy. A recent paper specified nitrogen dioxide, PM10, and traffic-related pollution as most strongly associated with autism. Another study identified methylene chloride, diesel particulate, manganese, nickel, lead, and mercury in the air as associated with autism, particularly in boys. Traffic-related air pollution has also been linked to hyperactivity. New studies showed that prolonged exposure to black carbon and sulfates associate with hypomethylation – an underlying biochemical problem in autism. Products such as the Blueair filter offers quiet and efficient HEPA room purification. The best things you can do to prevent exposure to traffic pollutants are rolling up car windows and setting car vents to recirculate air. Portable air purifiers such as the Solair model can also help clean the air inside the car. • Avoid exposure to lead, arsenic, and other environmental toxins: Studies showed an association between ADHD and lead exposure. Exposure to both arsenic and lead during pregnancy was associated with intellectual disability. In general, lead levels are higher in urban areas and can be present in soils for very long periods of time. Lead can even be present in flaking paint, discount jewelry, imported foods and ceramics, and dust near present or past sources of contamination. Pesticides appear linked to autism and include heavy metals such as arsenic, mercury, and copper sulfates. Significant residues are present on fruits and vegetables. The “Dirty Dozen” list describes produce items prone to absorbing and retaining toxins. Keep in mind, even organic produce can contain some pollutants and pesticides from older, contaminated soil and air near crops. Purchase organic produce to reduce exposure risk as much as possible. Mycotoxins also associate with inflammation and oxidative stress that depletes glutathione – the brain antioxidant that is deficient in autism. Mycotoxins are produced by fungi and molds that are abundant in the environment as well as certain contaminated foods such as wheat, grapes, peanuts, coffee, and spices. • Avoid endrocrine disruptors such as phthalates and bisphenol A (BPA). Early life exposure to BPA is linked to symptoms shared by autism and ADHD, and animal studies showed that prenatal exposure affects DNA methylation leading to long-term genetic and behavioral changes. BPA is used in polycarbonate plastics and resins common in food packaging – cans and liners that we never notice. One study showed that daily servings of canned soup increased urinary BPA more than 100%. The Environmental Working Group noticed that some canned foods such as peas, beans, and chili contained more BPA than others. Recycled packaging and paper products also contain BPA that can easily absorb through the skin, and thermal receipts are surprisingly high source of BPA. Unfortunately, the new BPA alternative bisphenol S (BPS) appears to be equally estrogenic and similarly pervasive in paper products including paper currency, tickets, and thermal receipts. BPA appears to disrupt genes based on x-chromosome activity, though symptoms may also be a result of faulty glucoronidation, a detoxification process in the body. Glucuronidation appears reduced in some autistic children, resulting in insufficient elimination of plasticizers and related contaminants in the body. Phthalates are endocrine disruptors that are even more ubiquitous in our environment. A significant correlation was found between phthalates 5-OH-MEHP and 5-oxo-MEHP and autism, likely indicating a similar challenge of detoxification. Researchers found that children were exposed to PVC toys by mouthing PVC toys, while adults appear more susceptible to phthalates from food manufacturing or packages – particularly containing fatty foods. Phthalates can be found in a huge variety of products including PVC/vinyl shower curtains and flooring, plastic toys, air fresheners, nail polish, artificial leather, perfumes, moisturizers, soaps, and even detergents. Triclosan is another hormone disruptor found in antibacterial soaps and body products. • Limit exposure to propionic acid including gas and diesel fuel, certain pharmaceuticals, perfumes, flavoring agents, wood pulp wastes, plastics, and preservatives for wheat and dairy. Scientists have recently observed that propionic acid associated with autistic behavior in animals and changes in fatty acids. Propionic acid (PPA) is produced by gut bacteria like Clostridia and Desulfovibrio – increased in autistic children. Yet the manufactured version of PPA is produced by chemical companies and widely used to prevent moisture and growth of microorganisms in grains and livestock drinking water. Propionate esters are even attached to testosterone in anabolic steroids. One paper described how air concentrations of organic acids like PPA are higher during warm, clear days, indicating that solar radiation may contribute to their formation, especially from anthropogenic hydrocarbons in the atmosphere. Perfumes, often containing PPA and other neurotoxins, have the potential to cause changes in brain cells that could lead to autism. Use the Skin Deep online database to find the hazard score of body and cosmetic products. • Use clean drinking water: Trace amounts of heavy metals, pesticides, chlorination byproducts, drugs, and other toxins are common contaminants of drinking water. While cities must filter out a certain amount of contaminants like lead and pesticides, there are no requirements for pharmaceuticals that may disrupt genes and hormones. Recent studies showed links between autism and areas of high precipitation – particularly when those areas relied on surface water sources. Private wells are used by about 15% of Americans and can pose serious threats if they are not properly constructed, tested, and frequently monitored. Corrosion of pipes in and around the home can be a hidden source of heavy metal contamination including lead and copper. Basic home test kits are available online, but more comprehensive test kits are available through National Testing Labs. Unfortunately, most bottled water offers no guarantee of safety. In fact, EWG recommends that consumers drink filtered tap water considering the obscurity of information available from bottled water brands. A useful water filter buying guide is available from EWG. An elaborate database by The New York Times shows contaminants in drinking water around the country. The source, Environmental Working Group (EWG), also lists major cities throughout the United States. Local water quality reports can be accessed from the EPA, but these will not reflect contaminants in private wells or plumbing. The NSF database displays products searchable by filtered contaminant. 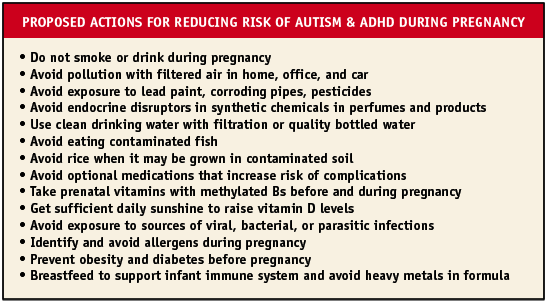 The burden of heavy metals in autism and ADHD continues to raise concerns about exposure through air, water, and food. Arsenic is one of the metals easily accumulated in autism and ADHD, and it is found in drinking water throughout the United States. A new faucet filter from Multipure is available that reduces arsenic (by 50 ppb) according to official NSF-certification. According to one study, reverse osmosis filters do not guarantee safety. • Avoid contaminated fish, and consume omega-3s through high-quality fish oil supplements: Lower percentage intake of these omega-3 fatty acids during pregnancy was linked to a significant increase in autism risk. The brain contains more fatty acids than any other organ, underlining the importance of fatty acid balance in brain development and function. However, certain types of fish consumption during pregnancy may contribute to the development of autoimmune problems in the child. Fish are sources of heavy metal contamination, and the number of polluted lakes and rivers is rising dramatically. Research on seafood and shellfish show a wide range of heavy metals that may accumulate in the organisms depending upon a multitude of factors such as species, geographic location, tissues, and season. If choosing to consume fish during pregnancy, refer to the EPA’s interactive map of fish advisories, but note that fish consumption advisories do not protect infants from long-lived contaminants like DDT and PCBs that remain in the mother’s body for years or decades. If choosing to supplement, be sure to purchase only high-quality fish oil, and store it in the refrigerator to avoid spoilage. • Limit excessive consumption of rice and rice product consumption until fetal safety is established: Rice readily absorbs heavy metals and toxins from the water in which it is grown. Like fish, rice is a major source of methylmercury exposure in mercury-polluted areas, especially mining areas of China. Furthermore, rice and rice products may contain significant concentrations of arsenic, with levels averaging between 2.6 to 7.2 micrograms per serving. Arsenic can reach much higher levels for brown rice products brown rice syrups, rice pasta, and rice drinks. The FDA sets an “action level” of 10 parts per billion for water (and apple juice), which is equivalent to .01 micrograms per gram. Organic food labeling does not indicate heavy metal content, and rice can absorb arsenic from pesticides as well as naturally occurring deposits in the soil. A summary of arsenic in rice products is available from the FDA. Sadly, there are no US regulations that apply to arsenic in food. • Discuss risks of drugs, including antidepressants, with medical professionals prior to pregnancy: A large Swedish study found an association between high-functioning autism, maternal depression, and the use of SSRIs and other antidepressants. Medication, including anti-inflammatories, increase intestinal permeability and the chance of absorbing potentially harmful substances through the gut lining. Even caffeine during pregnancy increased risk of brain abnormalities in animal studies, though it is too early to determine harmful levels in humans. • Prenatal vitamins with methylated B vitamins before and during pregnancy: We know it is very important to consume sufficient B vitamins during pregnancy, yet we face conflicting information. One paper describes a lower risk of autism with prenatal folic acid supplementation, while another associates increased risk of autism with synthetic folic acid supplementation. An animal study went even farther, suggesting that maternal arsenic exposure plus high folate consumption changed the genes to negatively affected neurodevelopment in the fetus. This duality in B vitamin support might be explained by how different types of vitamin B mix with individual genotypes that experience poor methylation – a natural process of using molecular methyl groups in the body. Hypomethylation (reduced methylation) appears to be a common challenge for children with ADHD and autism, and studies showed a connection between autistic children and hypomethylated DNA from their mothers. Mothers with the MTHFR gene may have difficulty absorbing folate and experience higher rates of miscarriage, and about 40-60% of the population carry problematic genes. To make matters worse, most multi-vitamins contain non-methylated B vitamins (such as cyanocobalamin) that require the body to methylate the vitamins to use them. Fortunately, newer vitamins like Thorne’s Basic Prenatal now contain methylated B vitamins which are easier for some people to absorb. Considering these recent insights, genetic testing may be an important prerequisite to purchasing prenatal supplements in the future. • Encourage vitamin D synthesis in the body through regular, sufficient sunlight-skin exposure: Vitamin D is a hormone created in skin when exposed to the UVB rays from direct sunlight. The amount of vitamin D generated depends upon the skin color, amount of skin exposed, geographic location, and time of day. Darker skin requires more time to produce vitamin D. Studies have indicated that sun exposure contributes more to vitamin D levels than foods and supplements, though oral cholecalciferol may be the only option in certain seasons and locations. The half-life of vitamin D in blood plasma is 1-2 months, which may help explain why autism was higher in babies conceived during winter months. Keep in mind, excessive sun exposure may contribute to skin cancer in paler skin types, but sunscreens can contain endocrine disrupting chemicals such as benzophenone-3 that may potentially affect the fetus. • Reduce risk of bacterial, viral, or parasitic infections: Activation of the mother’s immune system during pregnancy has been linked to the child’s risk of behavioral conditions such as schizophrenia and autism in the case of hospital admission. Furthermore, animal studies showed that viral exposure may affect hormone levels differently between male and female offspring. Another study linked fever during pregnancy – but not flu – with autism and developmental delays. One tried-and-true home remedy for reducing fever is the application of egg whites to the soles of the feet. • Know that vaccinations during pregnancy have not been proven safe (or unsafe) for brain development in the fetus: The few safety studies that are conducted on vaccinations in pregnancy are limited to evaluating immediate health risks to the baby such as size or preterm delivery. The transference of immunity from mother to child is an obvious benefit to immune health, and immunizations have saved countless lives. Yet our methods of stimulating the immune system introduce potential toxins such as aluminum, organic mercury, and formaldehyde to the developing fetus. The struggle to find associations between vaccinations and complex conditions such as autism has been understandably difficult when each person has unique susceptibilities. Furthermore, safely and ethically measuring fetal toxicity in the womb is currently impossible. New information compared DTaP vaccines with and without thimerosal and associated organic mercury exposure with autism diagnosis. Although mercury-based thimerosal was removed from most vaccines after 1999, it is still present in many influenza vaccines and one brand of DTaP. As discussed in the previous post, aluminum exposure has consistently increased in vaccine adjuvants as well as a wide variety of foods and products without safety data for neurodevelopment. 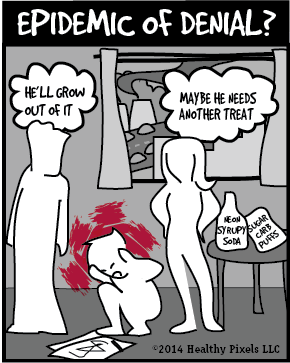 Evidence indicates that aluminum can accumulate and inflame the brain with devastating, long-term results. Aluminum also combines with elements like fluoride in the body and produces symptoms of autism and immune dysregulation. • Avoid nutritional or environmental triggers that contribute to allergic disease: Allergies can also burden the immune system and, as one study concluded, “may be a contributing factor to the formation of brain antibodies in autism.” Though sugar-sweetened drinks did not correlate with asthma or allergic symptoms in recent studies, artificially-sweetened drinks did. As discussed below, identifying allergens and avoiding them may be very important steps toward improving a child’s long-term health. • Prevent or treat diabetes and obesity before pregnancy: Research found that children of mothers with metabolic conditions such as diabetes, high blood pressure, and obesity were at higher risk of autism and developmental delays. Children of mothers with high pre-pregnancy body mass also showed higher risk of ADHD. Blood glucose should be carefully monitored during pregnancy, and a home monitoring kit can be convenient and possibly beneficial for birth weight. However, home monitoring may not be effective in glycemic control or pregnancy outcome. Maintaining good metabolic health appears to be very important before and during pregnancy. • Breastfeeding is an important benefit to infant immune health: Breastfeeding was linked to reduced risk of ADHD in children and autism, though much more research is necessary. Breastfeeding also showed a protective effect on stuttering, a common symptom with autism. Considering the dangerously high levels of minerals and heavy metals in infant formula, breastfeeding may prevent exposure to these as well. Keep in mind, breastfeeding cannot protect a baby from toxins absorbed or consumed by the mother. Early recognition of risk factors may allow us to improve nutrition, environment, and lifestyle before a baby begins to develop. New research shows that a mother’s immune system may dramatically affect her baby’s brain development and the risk of autism and other developmental disorders. For example, maternal diabetes – an increasing autoimmune problem – was significantly associated with greater autism risk. Because treatment of gestational diabetes does not appear to provide much help, prevention and control of blood sugar before and during pregnancy may be the best approach. Low thyroid activity or hypothyroidism during early pregnancy was also associated with autistic symptoms, and many environmental contaminants can affect thyroid function. Determining the impact of heavy metals in the body has been much more difficult to achieve, and results can be inconsistent when associating them with health conditions. As symptoms of mercury toxicity resemble autistic symptoms, there has been much interest in measuring mercury accumulation in the body. Hair samples have been used for many years to determine build-up of fish-based methylmercury, and urine samples can help reveal inorganic mercury accumulation from amalgams. Innovative blood tests from Quicksilver Scientific can now do both using mercury speciation to help identify different forms of mercury in the body. Still, we have no direct way to measure mercury or other toxins that remain “stuck” in brain tissue or other organs that might influence ADHD or autistic symptoms. Genetic testing offers new hope in screening for autism, and many different genotypes are moving into the spotlight. The MTHFR gene’s various polymorphisms have been associated with autism as well as ADHD in certain populations. In some individuals, the MTHFR gene can impact methylation, further emphasizing the importance of proper folate supplementation before and during pregnancy. The influence of MTHFR gene mutations may also be driven by diet and environment in ways that require further study. For example, autistic subjects with a type of MET gene show potential sensitivity to air pollution. There are a dizzying array of genetic mutations associated with a dysfunctional glutathione pathway, and the gene-gene interactions seem to contribute to the wide range of symptoms involved. Tests for allergies and autoantibodies have the potential to paint an even clearer picture. ADHD is associated with allergic and autoimmune disease. Alarmingly, autism is linked to maternal antibodies that fight against proteins in the brain of the fetus. The cross-fire is a result of fetal microchimerism, the process of cells passing through the placenta. This risky business may help explain adult autoimmune diseases like lupus and thyroid disorders that are prevalent in middle-aged women. It may also work in the other direction, instigating certain autoimmune diseases in children. The MIND Institute at UC Davis is developing a test that will predict a child’s risk for autism based on maternal autoantibodies. If brain development can be affected by immune activity, we may find it useful to evaluate the mother’s allergy and autoimmune status prior to pregnancy. For example, one study showed the incidence of infant eczema was reduced when mothers avoided exposure to food allergens during pregnancy and lactation. Both allergy and intolerance tests can measure immune response to foods, pollens, metals, additives, and other substances. Various autoantibody tests can also be conducted to confirm autoimmune disorders, though some autoantibodies do not appear until much later in the disease process. Keep in mind that autoantibody tests vary in sensitivity, reliability and consistency. Why do these autoantibodies develop in the first place? Why are we becoming so intolerant? How can we prevent this from happening? These questions form the most important puzzles left to solve. The geoepidemiology of autoimmune disease examines the interaction between genetics and environment. Geographical differences that affect immunity appear to involve pollutants and toxicants, reduced UV exposure, infection, and nutritional factors. While we identify the risks that lurk in and around us, we must consider immune support through antioxidants, omega-3 fatty acids, probiotics, and sun-induced vitamin D – particularly before and during pregnancy. But before taking a one-size-fits-all supplement, it is important to analyze body chemistry and imbalances. Any type of supplemental treatment should follow the results of comprehensive, reliable tests for accumulated toxins, food intolerances, autoimmune conditions, and vitamin or mineral deficiencies. Part 3 of this series will post next week and outline some of the current tests and diagnoses for autism and ADHD. Excellent articles so far, thank you! I scanned this article at your Proposed Prenatal Protocol but didn’t see one of the most vital ingredients for success in mental health pre-conception onward which is the vastly underestimated and vastly under ingested Iodine which is the worlds number one mental health cause by its deficiencies. Thats just one major aspect of Iodine deficiency disease of so many. Dr. Jorge Flechas, along with Dr. Brownstein and the late Dr. Abraham have done incredible work on this. Flechas has done amazing work with oxytocin, derived from Iodine sufficiency, in helping Autism patients in a great way. Worth considering and adding to this important list. Blessings.